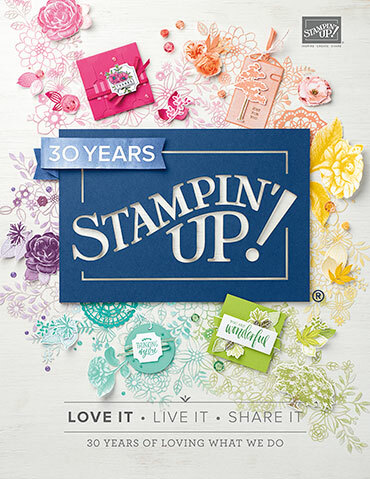 Welcome to the weekly Stampin' Up! Artisan Design Team Blog Hop! Over the month of July we have had a team theme each week. Where do these theme's come from you ask? 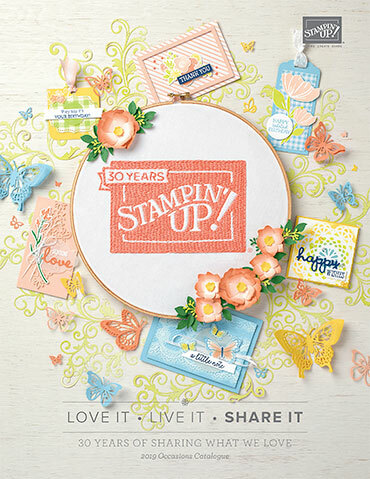 Well ... the Stampin' Up! 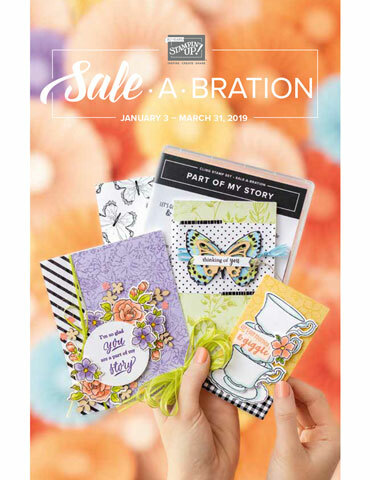 Annual Catalogue is divided into "chapters" to help you find what you need for the occasion you are creating for. Check out page one of your catalgoue! Can you see how loved my catalogue is? I take it to get coil bound each year. I add flags on pages to sort my favorite sections. Do you take extra care of your catalogue? Mark it, flag it, organize it? So this week we are creating with the everyday chapter in mind (page 73). If you follow my blog you will know that I love to create with wood. This is not the first time I have used a chunk of a 2x6 piece of lumber to create something. In fact, I always have lumber in my craft room ready for when inspiration strikes. (Of course my wonderfully handsome husband has them all cut for me!). 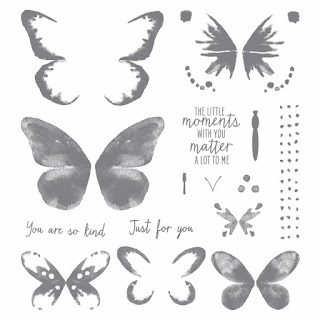 The Watercolor Wings stamp set is a beautiful set! 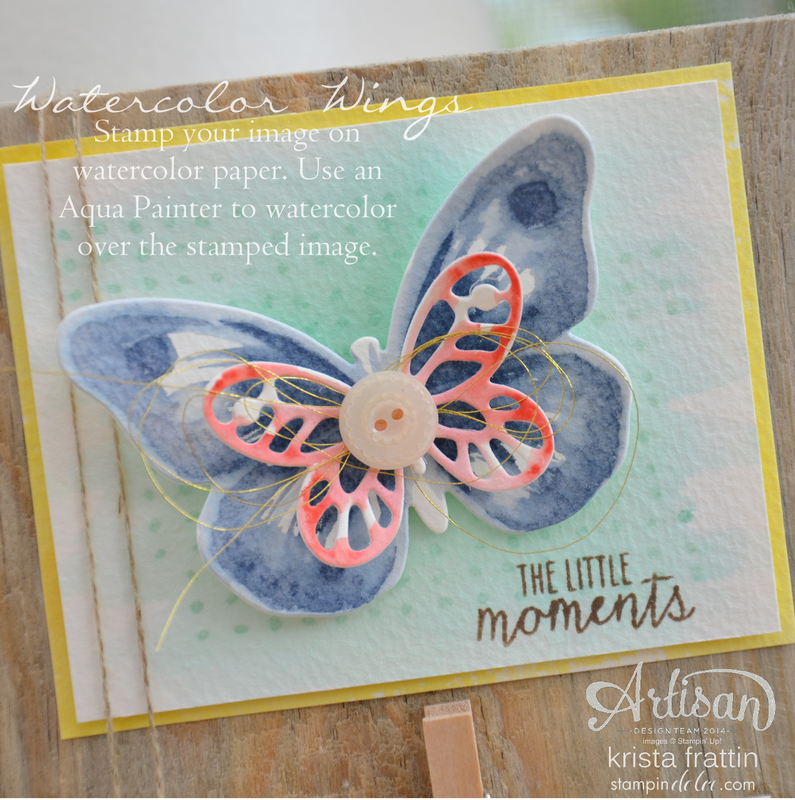 It comes with stamps that layer so that you can create a butterfly with very little ease. Of course this stamp set comes as a bundle with the matchy matchy Big Shot Bold Butterfly Framelits! This will save you 15%. You can not have this set without the die! Trust me! I took it a step further and added a watercolor technique. Stamp your images onto dry watercolor paper. 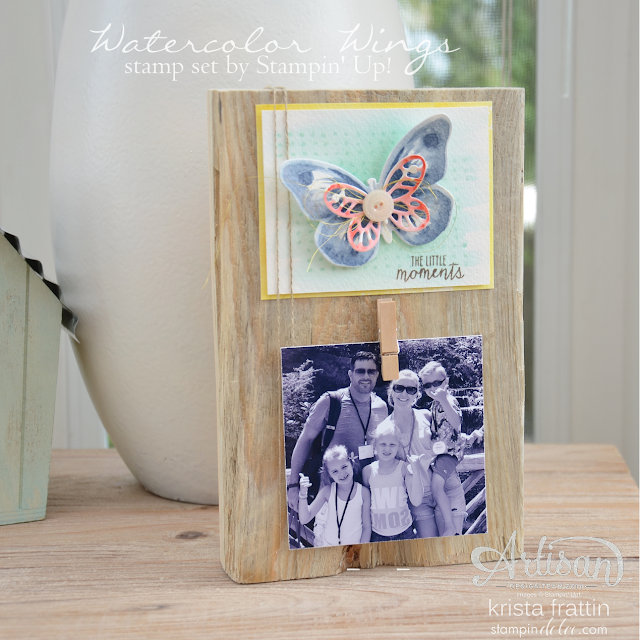 Fill your Aqua Painter with water and use it to watercolor over the stamped image. So easy, right? Okay ... one more project. I used a 2x6 piece of lumber again. 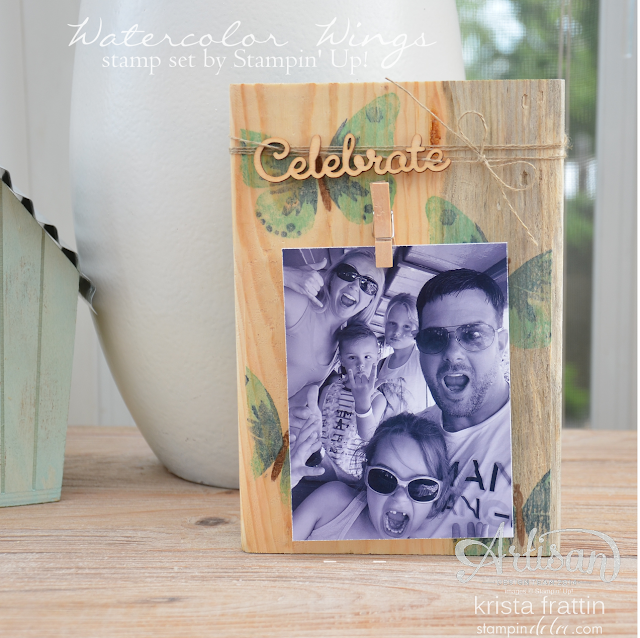 This time I stamped with Classic Stampin' Up! ink directly on the lumber! This technique worked great on this type of wood as this lumber was relatively smooth. The grainier the wood the harder it would be to make image turn out. I would think that oak, a smooth pine or maple would be good to stamp on (just more expensive!). You can't get much cheaper than a 2x6! 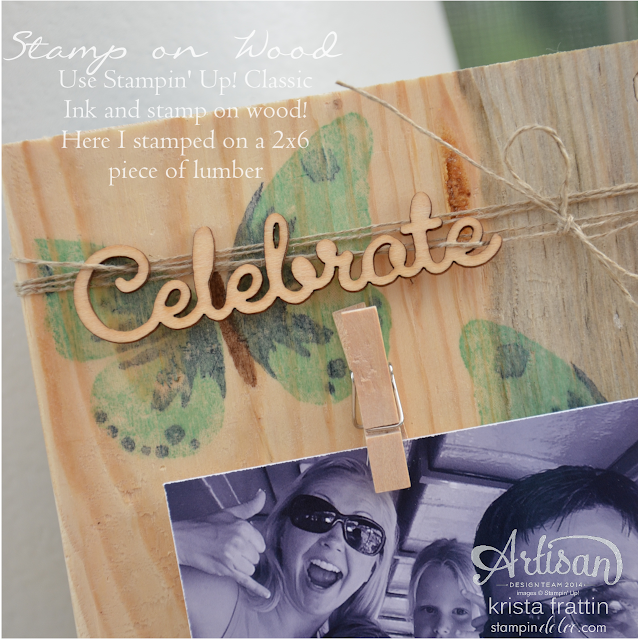 Can you believe that I have been creating and blogging with the Artisan Design Team for a year now? Today is our last post with the 16 designers that you have followed all year. We will say good-bye to two amazing designers - Lisa Harlow & Victoria Hayes. 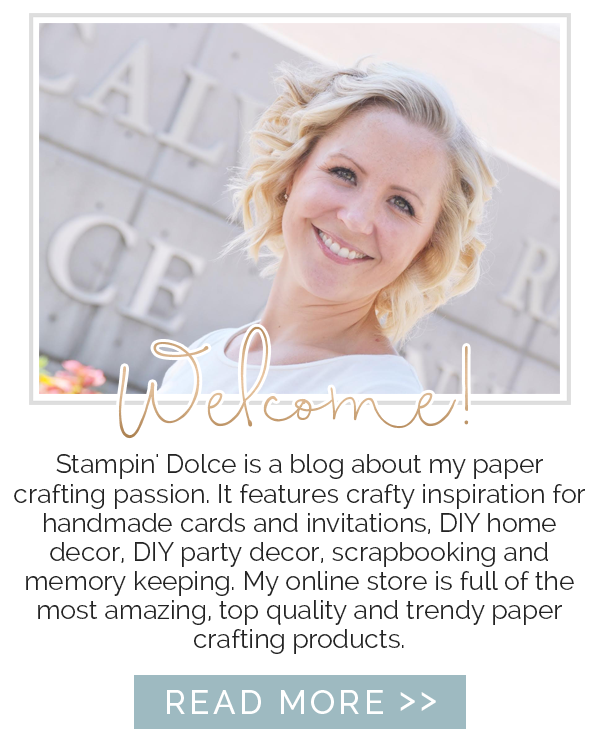 The team was asked by Stampin' Up! if we wanted to extend our duties until October when a new team will be appointed. 14 of us will continue blogging each Thursday. Lisa and Victoria have created amazing projects each week and I will miss their contribution to the team! But do not worry!! You can still follow Victoria and Lisa on their blogs and see there beautiful projects! So for the final week ... click on over to Lisa Harlow!